The Walking Dead Series Premiere: What Did You Think? I was intrigued by The Walking Dead from the start. Zombies are a concept that is normally saved for movies, so it’s a unique idea to cover this genre on the small screen. Moreover, the fact that the drama aired on a network responsible for Mad Men and Breaking Bad made the idea seem that much more enticing. And if that weren’t enough to pique my interest, Frank Darabont, director of The Shawshank Redemption, directed the first episode. After watching what felt like a feature length movie, “Days Gone Bye” not only held my interest, but has me looking forward to following these characters for a long time. First, the makeup and effects of the zombies are fantastic. They give a chilling and scary feeling as they walk around on screen. Plus, the fact that there’s a “viewer discretion advised” attached to the show illustrates just how far the boundaries are going to be pushed. How many bloody headshots were there? How disgusting was the horse being ripped apart and eaten? It all felt so real. This also includes its characters. Rick Grimes is a fantastic protagonist. The way he carries himself is certainly that of a leader and someone on whom others can count. He’s not brash or trigger happy, but he knows how to use a weapon. I like that aside from the zombie outbreak, his life isn’t perfect. He has issues to deal with and emotions to conquer. This is a character to whom we can relate. The increased look of confusion and horror as Rick moves from the hospital to his home is very realistic. I can understand his feelings and bewilderment, especially when he sees his first zombie. All he can do is run away from something that seems unimaginable. Isn’t that how we would feel in the same situation? 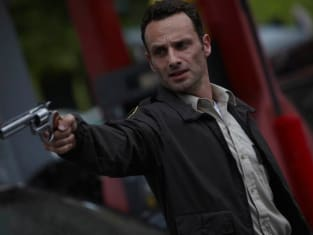 Rick meeting up with Morgan Jones and his son gives us a look at how someone would deal with a loved one becoming a zombie. His experience shows how Morgan maintains certain morals and even continues to monitor his son’s manners, despite the broken society. Even when he is faced with the prospect of killing his undead wife, he can’t bring himself to pull the trigger. He can’t move on - literally and emotionally. Another storyline that will certainly become interesting involves his best friend and partner, Shane Walsh. 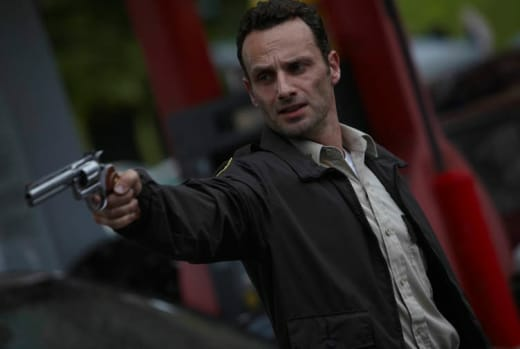 He has started an intimate relationship with Rick’s wife while he leads a group of survivors. Not only is Rick not going to be happy, but also there is the potential for a power struggle when he shows up. These types of moments will keep the show about the people rather than the blood and effects. 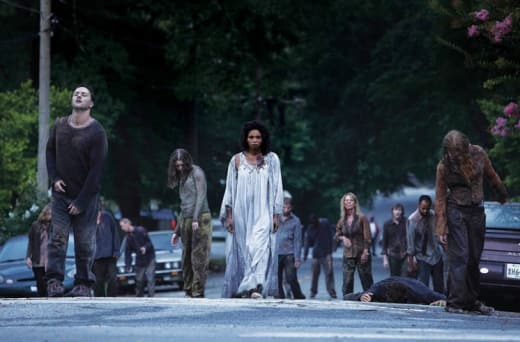 It is the climactic scene in Atlanta that gives off great visuals of Rick on horse, the devastation of a great city, and the look of the zombies. I know that because Rick is the main character, he’s going to survive the mob of creatures. However, it didn’t stop me from feeling as tense and nervously claustrophobic as Rick struggled to escape. I was so glad he was able to hide in that tank even though the zombie soldier made me jump when he came to life. This is no campy zombie story but a gritty, real-to-life tale of moral fiber and character development sprinkled with a fantasy element. Where zombie movies end in two hours, we will get the chance to see what these people are really like over a period of time. When the rules no longer exist and survival is everything, what type of person is really at the core? I’m eagerly waiting next week to get some of my questions answered. Who was the voice on the radio? Will Rick find his family? What caused the zombie outbreak? Most importantly, what are your thoughts on the show?